Today, I'm writing about the story behind the song Jailhouse Rock from the 1957 musical of the same name. The movie stars Elvis Presley as a convict turned rock 'n' roll star. This article is part of The 2017 Summer Under the Stars Blogathon hosted by Journeys in Classic Film. Aug. 16 is Presley's SUTS Day. When Elvis Presley arrived on the scene in the late 1950s, he changed American pop culture forever. His style of rock 'n' roll music and wild, hip-swinging dance movies signified a sea-change in old Hollywood movies, which had thrived for three decades on the graceful movements and low-key crooning of stars like Fred Astaire and Bing Crosby. Elvis' performance of the song Jailhouse Rock in the 1957 MGM movie of the same name is an intriguing blend of both worlds: It's a rockabilly number with Elvis' signature wild dancing that also is highly polished production number in the grand tradition of MGM musicals. Here's a clip of the number below. Jailhouse Rock is the penultimate number in Elvis' third movie, which is about an ex-convict named Vince Everett, who, with the help of a canny music promoter (Judy Tyler), becomes a nationwide singing sensation. 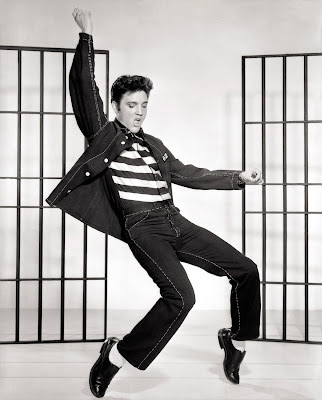 Jailhouse Rock, along with four other songs in the film, was written by the team of Jerry Leiber and Mike Stoller, who were responsible for several groundbreaking rockabilly songs, most notably "Hound Dog," which was one of Presley's first big hits. However, Leiber and Stoller didn't really care for Elvis' interpretation of their song and they only reluctantly agreed to write the music for Jailhouse Rock; in fact, the only way MGM executives got any songs out of the pair was by locking them in their hotel room, according to the Elvis biography Last Train to Memphis by Peter Guralnick. In the movie, the elaborate Jailhouse Rock number represents Vince's breakthrough into music stardom and director Richard Thorpe and choreographer Alex Romero planned to film the scene in the grand style of MGM's past musicals. However, once Elvis reported for work, the two men found that their new leading man was much different than MGM's past musical stars. Romero had worked out several intricate dance steps for Elvis, but he failed miserably at performing them, so Romero went back to the drawing board and created a few simple steps that Presley could easily follow (Presley picked up the move you see in the top photo from actor and dancer Russ Tamblyn whose beach house he and his vast entourage often stayed at on weekends). According to Guralnick, Elvis "flung himself into the number with total abandon" even continuing to work after he swallowed one of his teeth caps and aspirated a lung (Presley had to have surgery, but he recovered in a few days much to the relief of Presley's manager, Col. Tom Parker who was worried his prized client might never sing again). In the end, all of Presley's hard-work paid off with a No. 1 record on the Billboard charts and a sizable box-office hit. Jailhouse Rock is still an electrifying number forty years after Presley's untimely death. Elvis, who had a vast knowledge and appreciation for all types of music, half sings, half shrieks the nonsense lyrics in the style of Delta Blues performers, but it is his physicality that makes the number so watchable. Elvis isn't as polished a performer as the professional back-up dancers behind him, but his natural charisma and unique way of carrying himself (he is instantly recognizable even in silhouette) make him the undeniable center of audience's attention. Elvis continued to perform Jailhouse Rock throughout his career, most notably in his 1968 comeback special (clip below). Jailhouse Rock is airing at 6 p.m. Aug. 16 on TCM. It is also available on DVD, Blu-ray, and video on demand.